Storm Goddess Book Reviews & More: Jenna Jaxon Guest blogs! Welcome to Tuesday everyone! Please help me welcome my special guest, Jenna Jaxon! Let's see what fun is in store for us today with Jenna! There are many movies set in historical times, and a fair share in my favorite period, the middle ages. There are some wonderful films set in or near the same time as my medieval romance Betrothal. These are some of my favorites. How many of these have you seen? 1. 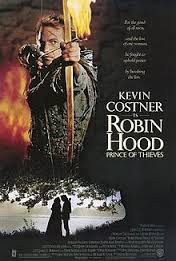 Robin Hood, Prince of Thieves. I love this movie and watched it so much on VHS that I know almost all the dialogue! The time period is that of the Third Crusade, roughly 1190, so it’s somewhat earlier than Betrothal, set in 1348. However, the costumes, settings, and props create a great feel for the period. 2. Name of the Rose. Another great movie that very realistically portrays the lives of lower class and clergy of the period. Set in 1327, this murder mystery is only about twenty years before my romance. And it’s true that monasteries were depositories for manuscripts when the only way to produce them was to copy them by hand. If you wanted to read (usually only clergy and nobles could) you had to own your own very expensive manuscripts or trek to isolated libraries to read them. In Betrothal, as Alyse is of nobility, she shows off her education to Geoffrey and the courtiers. 3. Pillars of the Earth and World Without End. Based on novels by Ken Follett, these two mini-series are fantastically close to the period of Betrothal. World Without End, in fact, covers the exact period. I urge you to watch both series--I made my husband sign us up for Showtime for the month Pillars came out, just so I could watch it. He bought me the DVD for Christmas. 4. Braveheart. Yes, it’s set about 70 years too early, and has numerous historical inaccuracies. But it portrays King Edward I and Edward II, and Princess Isabella who are the grandfather, father and mother of King Edward III, a major historical figure in Betrothal. And it’s a great piece of action adventure and romance. The Princess’s costume is very well done and might have still been seen, in part, in 1348. 5. A Knight’s Tale. Love, love, love this movie! And I usually HATE movies with historical anachronisms. But this one is charming, it’s set about 20 years after my story, and it does include very realistic jousting sequences. Watch them and then read Betrothal to see what Geoffrey and Thomas would have gone through. Edward, The Black Prince, was the elder brother of Princess Joanna in Betrothal. So there you have it, my top five medieval movies. If you haven’t seen them, and you love the period, you really must. And I hope I’ve whetted your appetite for all things medieval, because Betrothal, Book 1 of Time Enough to Love, is available on sale for .99 on Amazon through today! 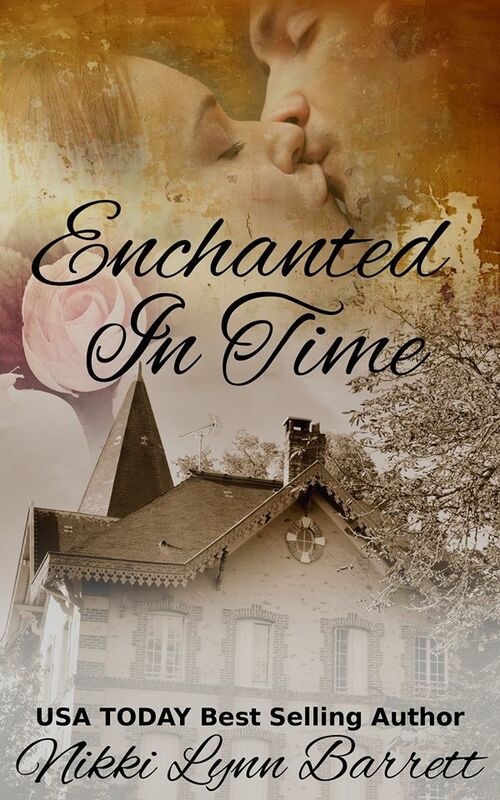 EXCERPT: He kissed her hand and wound her arm through the crook of his as he led her away from the chapel toward Princess Joanna’s apartments. Although she was loath to admit it, his words, as well as his attentions, had soothed her ruffled feelings. She smiled inwardly to think that his regard for her ran so deep. A quick peek at him from lowered lids showed her his countenance bore a smile also. They seemed to have come far in but two days’ time. He seemed both solemn and excited by whatever message he had brought. It had to be news indeed, for she had heard nothing, either last night or this morning, that would touch upon them. This mystery so bemused her that she almost failed to see him lean down, bringing his mouth mere inches from hers. 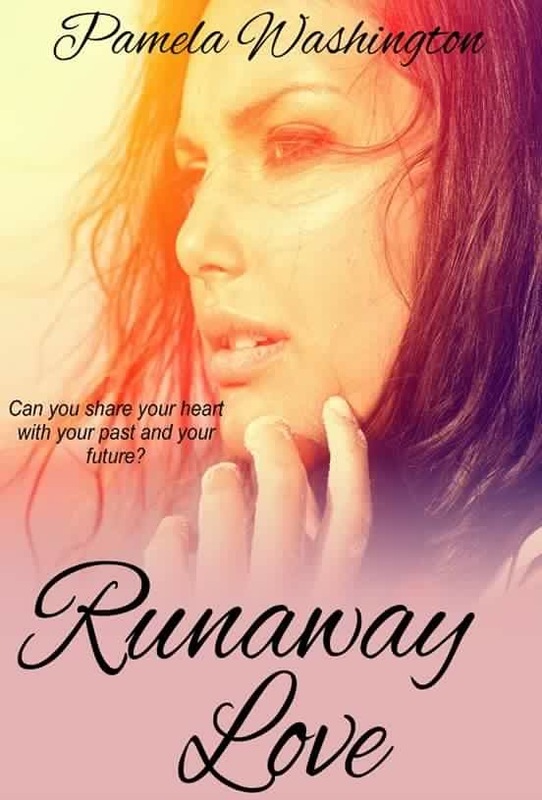 She gasped, snatched her hands from his and ducked around him before he could draw closer. Alyse nodded and frowned. The mere thought of jousting sent a quiver of dread down her spine. But his statement was hardly news; the court had been preparing for the tournaments for weeks. I've seen most of your favorites. 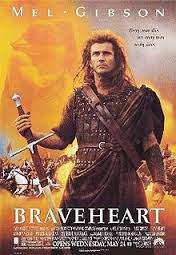 Braveheart probably takes the cake. There's something about that underdog tale that resonates with me. Thanks for coming by, Melissa. Yes, I love the emtional scope of the movie, but must admit I can't watch Wallace's execution. Too gruesome. 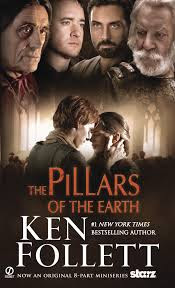 I can't believe I didn't know about Pillars of the Earth and World without End! Now I have them in my netflix and on the way. Thank you. Enjoy, Andrea! They are fabulous as were the books. I wish I had time to re-read them, but I can watch them in less than half the time. That makes me feel lazy! LOL Thanks for dropping by. The middle ages has always fascinated me. Of your top five, I think it's a tie between Braveheart and A Knight's Tale. Seen them all except the Pillars one. I have never watched the end of Braveheart. Can't stand to know what happens. It makes my stomach churn just thinking of it. Love the jousting in A knight's Tale. If I had time to watch movies, I would watch that last one...oh wait, I'd also have to remember it's name, which I've already forgotten. It was the one after Braveheart which you assigned us to watch before reading your book, but since I've already read your fabulous book (Gave it FIVE STARS) I'm incapable of following instructions, which I do badly anyway. But if I had time and could remember it's name, it sounded like a good movie. Bet your book is still better. They should make a movie out of it. When is the next one coming out? If you're giving out 5 stars, Liza, you can make up your own instructions! LOL Thanks so much again for that fabulous review! A Knight's Tale is a fun romp for relaxing--you should try that some time. :) I'd so love for them to make a movie out of Time Enough to Love! Betrayal is with the editor, so as soon as I get the edits back...I'll keep you posted! A Knights Tale, sigh. My daughter watches it at least twice a year. I watch it every time I find it on TV. LOL I really need to get my own copies of all these movies. I have Pillars, and had Robin Hood on VHS. I could have a Medieval Marathon! Thanks so much for coming by, Collette! You know how I love my KISAs. All those movies rock. Name of the Rose is pretty great. Not sure if you would include Ladyhawk since it has fantasy elements but still a very good medieval tale also. I came so close to putting Ladyhawke on the list! LOVE that movie. Rutgar Hauer--Jeeze. He could play Geoffrey or Thomas any day. :) I also almost included The Lion in Winter too. Maybe it should have been a list of 10 instead! Thanks for stopping by, Kary. I saw Braveheart as well. I didn't see the mini-series of Pillars of the Earth but I've read the book a couple of times. Betrothal is a wonderful read. Tweeted. Thanks, Ella! The mini-series is really great, especially if you liked the book. It's very faithful. Thanks for the tweet! There are a lot of Joan of Arc movies--and I don't think I've seen any of them! I am remiss. And yes, her dates are a little later than Betrothal--she was born in 1412. But the common life was probably not very different 60 years after. Thanks for coming by, Sara! 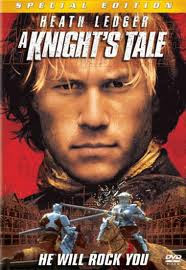 There's so much to love in A Knight's Tale, but the physical and verbal jousting, as well as Heath Ledger, are what make it worth seeing again and again. Being a writer -- and an English major -- I love the scenes with Chaucer announcing William, aka Sir Ulrich von Liechtenstein. Fun post, Jenna! I love the Chaucer scenes also. So not how we think of the writer. LOL I didn't know until I did a little research, but Sir Ulrich was a real person. I thought William had made him up. LOL Thanks for stopping in, Sophia!